Many methods of payment are open to you upon ordering, the most popular being online purchasing. We accept all major credit cards online or a payment over phone or FAX is also supported. All ordering methods are completely secure and therefore completely safe. Fulton Squares lawn ornaments and garden accessories are some of the highest quality lawn and garden hooks on the market. 5/8" steel rod makes them a hook that will support the largest floral display. 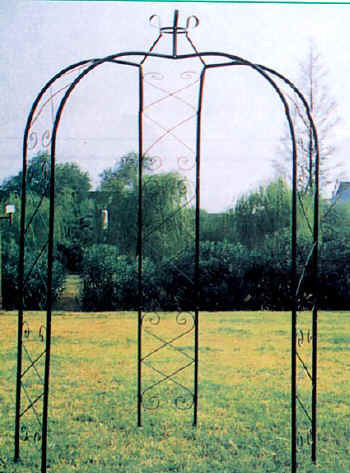 Mark the path to your garden with this nifty archway! Manufactured from tubular steel, and scrolled steel wire. Strong steel construction ensures that it will withstand the most extreme seasonal changes. A symbol of the love and care you have for you home and yard. Fulton Squares lawn ornaments and garden accessories are some of the highest quality on the market.